Recently I was sorting through the SportSecurities PC and came across a fantastic piece. 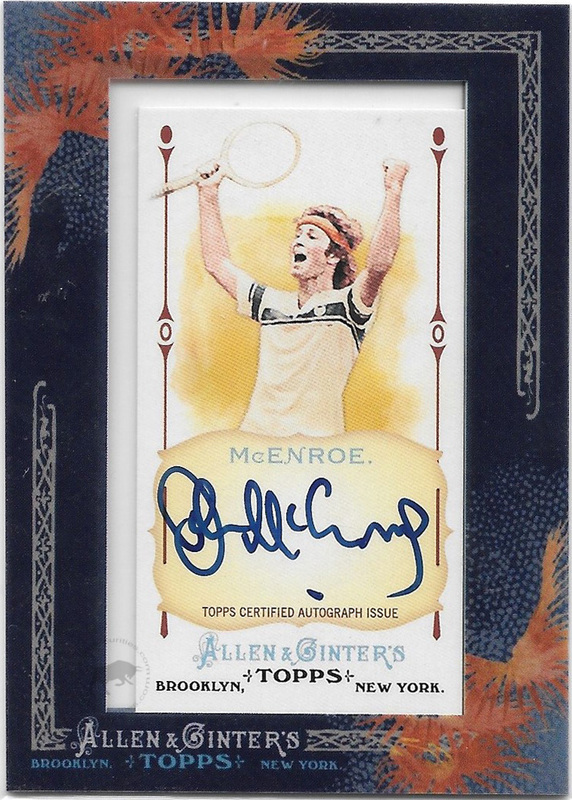 It was the 2011 A&G John McEnroe Framed Mini Auto (AGA-JMC). Holding it in my hand I began to reminisce how I acquired the card and why I liked it so much. So, rather than keep it to myself, I decided to share with the SportSecurities community. Besides acetate cards, I really like mini cards. It must be their likeness to T206 cards, regardless I love the minis. Furthermore, I love how Topps encapsulates them with the frames. John McEnroe was a childhood hero. He made those boring tennis matches that my dad would make me watch, fun and exciting. I still think that the movie Happy Gilmore is a golf adaptation of John McEnroe’s personality. The autograph on this card is hard signed and clean. This card was a redemption that took almost a year to have fulfilled. There is a 2012 version that was packed out before the 2011 redemption (this card) was sent out.